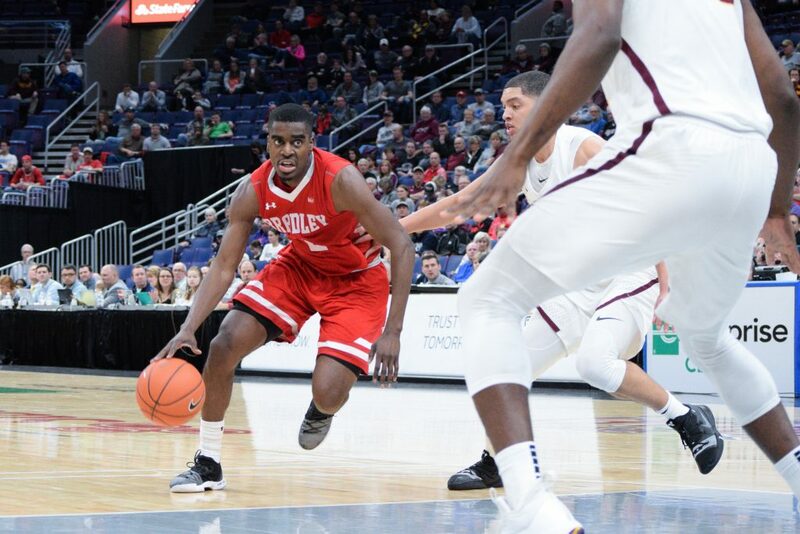 Senior Luqman Lundy drives to the basket in Bradley’s MVC semifinal victory over Loyola-Chicago. Photo by Justin Limoges. 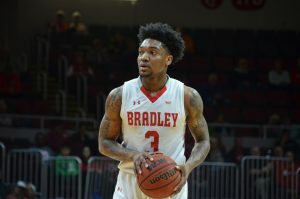 The Bradley men’s basketball team enters uncharted territory Thursday, facing off against the No. 2 seeded Michigan State Spartans in the first round of the NCAA tournament. The No. 15 Braves will look for their first victory over the Big Ten champions in program history. The Spartans lead the all-time series 4-0. The teams played a three game series in 2006, 2007 and 2008, as well as a game in 1969. Despite their 28-6 record and No. 5 national ranking, senior guard Luqman Lundy thinks the Spartans are beatable. Head coach Brian Wardle has spent the last three days watching tape on the Spartans and has concluded they have high basketball intelligence. The Braves have not played since their victory over Northern Iowa on March 10. Meanwhile, the Spartans are coming off a Big Ten championship win on Sunday. Despite not playing a game in 10 days, Wardle said he did his best to keep the team fresh. The Braves are a stout defense team, allowing just 65 points per game. 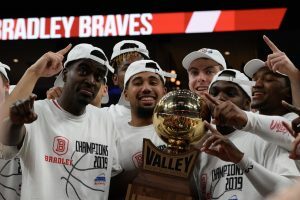 Junior guard Darrell Brown said the MVC’s defense-first mentality will help Bradley prepare for a Michigan State team averaging 78.8 points per game. 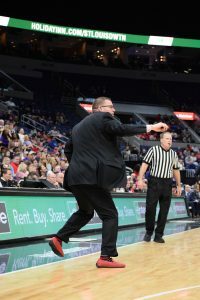 Last year, the MVC champion Loyola Ramblers went on to make it all the way to the Final Four, but Brown said Bradley doesn’t think about what other teams did last year. After being down by 18 in the second half in the win over Northern Iowa, Wardle said his team will always keep battling. However, he said he would prefer to not fall behind Michigan State. In the UNI game, Lundy stepped up when the Braves were down. Wardle, Brown and Lundy all said any player on the team can be the one to provide the spark. The Spartans and head coach Tom Izzo are playing in their 22nd straight NCAA tournament. Izzo lost to the No. 15 Middle Tennessee State in 2016. In order to avoid what happened in 2016, Izzo said his team needs to stop Bradley’s shooters. No matter the result, Wardle said he just wants his team to have fun on and off the court. Bradley made national headlines last weekend after revoking media access to Peoria Journal Star reporter Dave Reynolds. Bradley apologized to Reynolds and restored his access. Wardle said he apologized to Reynolds on Sunday and the matter has been resolved. The Braves and the Spartans are scheduled to tip off at 1:45 CDT. at Wells Fargo Arena in Des Moines, Iowa. The game will be broadcast on CBS.